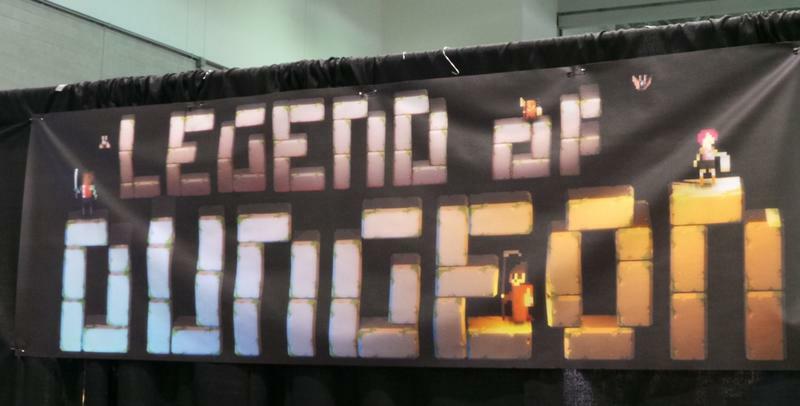 Legend of Dungeon is the Kickstarted and Steam Greenlight candidate from RobotLovesKitty. According to the developers, it’s all about death and treasure. We met with Calvin and Alix, the husband and wife duo that makes up the freshly formed RobotLovesKitty development studio, on the show floor early Saturday morning at PAX East. They gave us a brief glimpse of Legend of Dungeon and shared a little what it’s taking to make their dream a reality. 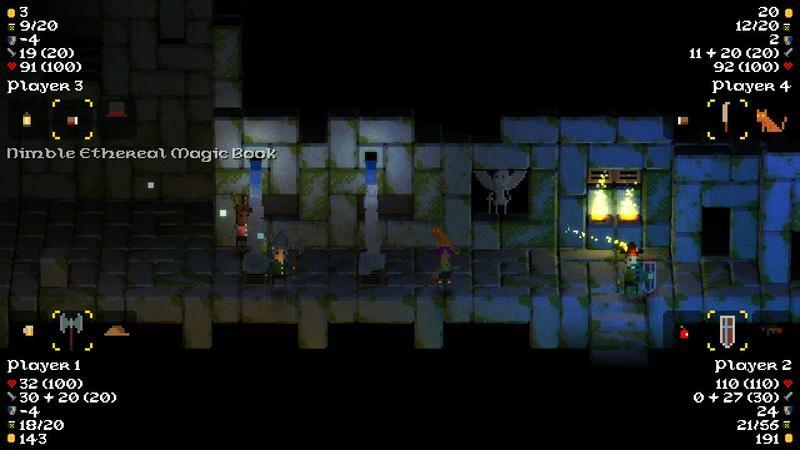 In Legend of Dungeon, players are tasked with going down and fighting monsters. There are 26 floors, and each one delivers crazy baddies and a whole assortment of items. There’s treasure on the 26th floor of this death pit, and your job is to reach that treasure, grab it and make it out alive. That’s a tough chore to handle when the monsters coming at you are both strong and random. During our demo, we made it to around the 8th floor before being absolutely rocked by NPCs. I played the game with three other players. 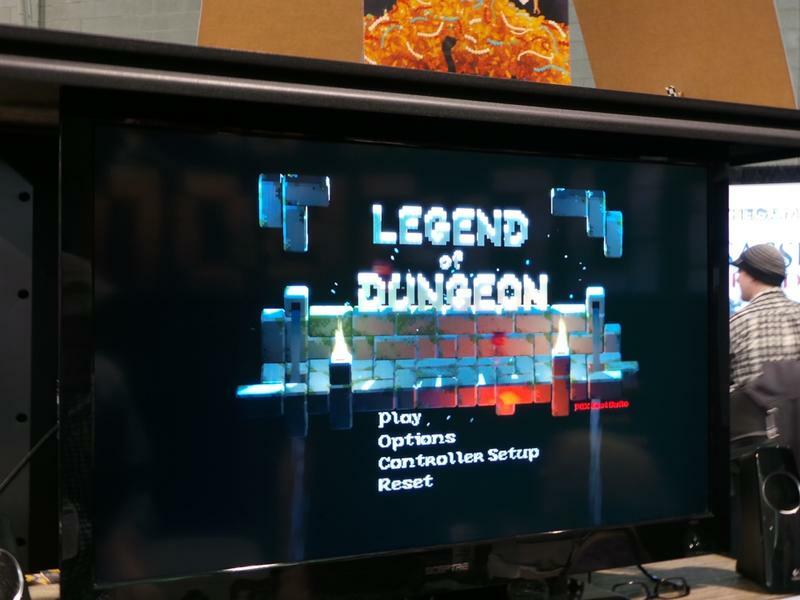 Legend of Dungeon supports four player, local co-op. The combat is basic. You start with a sword when you fire up the game with one of its initial classes. When you approach enemies, your one option is to hit them. As you crawl through the dungeon, you’ll find extra items and weapons. For instance, we scored a spell book that spawned a cyclops to fight for us. The item drops seem random, so that makes every playthrough unique. This is a semi-roguelike, so random generation and permadeath are a staple of the genre. If you’re playing with two or more players, you’ll float around as a ghost and try to collect enough health orbs to spawn again with 1 HP. The whole thing is simple on the surface and complex once you reach a certain level of depth. Legend of Dungeon is, more or less, a hack ‘n slash dungeon crawler very easy to pick up and play for newcomers. There’s still a lot to come for Legend of Dungeon. RobotLovesKitty are in the process of turning this game into a finalized vision. In the meantime, you can actually buy the game and further support the developers. Alix and Calvin told us that they spent two years working on this game from their own treehouse in the woods of Vermont. No, seriously, they built it themselves and used solar panels for power. Making games is expensive, and these two are in the process of trying to bring Legend of Dungeon to fruition. The release version of the title will likely hit this spring. You can vote for the game on Steam Greenlight in order to bring them some life on that platform, or you can buy it through their official site. If you buy the game now, you’ll get their current playable version immediately. Once the full version releases, you’ll get that too. We’ll have more from Legend of Dungeon as it comes.